I am writing without really knowing why. Sometimes writing is motivated by a new understanding, a ‘realisation’. But what realisation do I have? You can realise something, as in understand it, but surely to truly realise something means to ‘bring it into reality’, to live it. So to truly have a realisation means to understand something and then apply it every day. So what have I realised lately? In small ways, like gathering scraps and snippets and threads, I have begun to understand that the things I thought were important – security, companionship, money – are not as important as they seem. Sometimes it seems like we are all living a great misunderstanding. We need so little, and the smallest things are the greatest treasures. To sing, to love, to dance. To smile as we fall asleep and as we wake. We can choose to do these things, or choose not to. I have begun to glimpse that life is like a symphony of beauty and pain in equal measures. The music plays on, and each of us must decide how to play. We can choose to play with grace and humility. We can choose to play in such a way as to always push ourselves beyond our perceived limits. We can choose that if we trip up on a few notes, we smile and play on, no problem. We can choose to look up from the safety of our sheet music at the conductor, and feel safety and guidance in the movement of his hands. We can choose to play alone, and sometimes that is how the music is supposed to go. But at other times we are surrounded by a full orchestra, and we can feel the joy of harmony, the thrill of delicious syncopation. Or if we are feeling insecure, we can watch the hands and faces of our fellow musicians and feel strength in togetherness. We can sing a painful song together. Or we can even fall silent. In times when our voices will not sing and our hands will not play, we can just listen to the music that washes within and without, steady like a timeless tide. 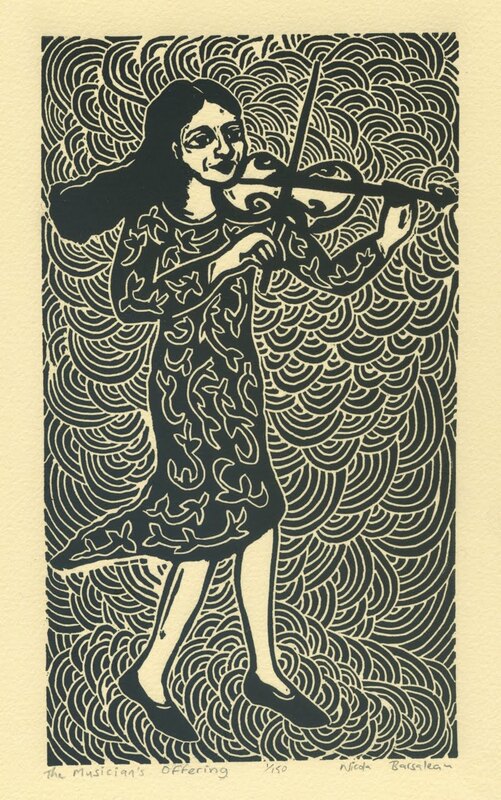 This beautiful lino cut was recently created by one of my old teachers, Nicola Barsaleau, a true inspiration. I often moan about the way technology influences my life. I remember the days when I didn’t own a mobile phone; when I actually received handwritten letters in the post and when a keyboard was something I played music on. It was kind of nice to not be accessible at every moment – or at least to be up against the expectation that I should be. Now, after travelling for the past five years on and off, my once fairly small social circle has exploded to include thousands, across continents and timezones. It can be quite overwhelming to stay in touch, or just understand the nature of those relationships, kept alive by Facebook messages and occasional Skype calls. The other day though, I thanked God for technology. I met a wonderful lady in Melbourne this year – a fellow Hare Krishna who also happens to love Carnatic music. While I was there we shared a happy hour swapping songs and ragas, and she told me how she’d been doing the same with another lady she knows in India. So last Friday morning we all met up on a conference call to have a music lesson – morning in London, afternoon in Coimbatore and evening in Melbourne. It was so enlivening, and unexpectedly easy, given that we couldn’t even see each other (which I know is possible too). We learnt ‘Jamuna Kinare’, a bhajan in Hindi by the Carnatic composer, Swati Thirunal. Below is a version sung by Prince Rama Varma. Ahh. Sharing music gives me a warm feeling inside. Perhaps I can live with Skype after all. Tonight I was sitting next to my mum and a few people commented that we looked ‘exactly like sisters!’ Compliment for her. Yes, I know I’m not getting any younger. Tomorrow marks one more year of being, and I’m surprised at how meaningless it’s starting to feel. When I was younger I was all into birthdays. Each year had a different theme, from St Patrick’s Day, to murder mystery, to Hawaii. It was fun. But now that I’m officially an old crotchet, I don’t feel much for the passing of another twelve months – except the realisation that there’s no time like the present to become more determined to live my words – put my thoughts into action. So many experiences this year have brought me to the understanding that I have to surrender. I know – it’s almost a dirty word in today’s society. Surrender is what you do when you get arrested, or when you realise that you’re going to be stuck in traffic, whether you beep the horn twenty times or not. Surrender means relinquishing control. Failing to take charge of life. Well, not really. At least not from where I’m standing. To me surrender means being satisfied with the fact that I’m not in control. It means acknowledging the divine source of everything in my life, and having faith that there is a higher plan. It means letting go to whatever vision I have of the way things are supposed to be, and listening, watching and learning as they unfold the way they will. Tomorrow is a birthday for me, but a funeral for my uncle. We step into this life for a few moments, and walk off through the wings after the play ends. It’s so important to make everything inbetween count. Not in a frantic way. Not anxiously watching the years passing, our bodies changing. But with grace, good humour, patience and faith. I love the way my dear friend Gaura put it in his song, ‘Surrender’. Heartfelt realisation.